[LICS 2019] Long-run satisfaction of path properties, joint work with Christel Baier, Jakob Piribauer and Ocan Sankur. [RSSRail 2019] Performance Evaluation of Metro Regulations Using Probabilistic Model-checking, joint work with Benjamin Bordais, Loïc Hélouët, Thomas Mari, Julie Parreaux and Ocan Sankur. [LICS 2018] Stochastic Shortest Paths and Weight-Bounded Properties in Markov Decision Processes, joint work with Christel Baier, Clemens Dubslaff, Daniel Gburek and Ocan Sankur. [Journal of Logic and Algebraic Programming] When are stochastic transition systems tameable? joint work with Patricia Bouyer, Thomas Brihaye and Pierre Carlier. [Information and Computation] A Tale of Two Diagnoses in Probabilistic Systems, with Serge Haddad and Engel Lefaucheux. [TACAS 2018] Parameterized Verification of Synchronization in Constrained Reconfigurable Broadcast Networks, joint work with Balasubramanian A.R. and Nicolas Markey. [MSR 2017] Diagnostic et contrôle de la dégradation des systèmes probabilistes, joint work with Serge Haddad and Engel Lefaucheux. [Concur 2017] Controlling a population, joint work with Miheer Dewaskar, Blaise Genest and Hugo Gimbert. Anirban Majumdar, Games for distributed networks: models and algorithms, with Patricia Bouyer. Program committee member of: STACS'16, TACAS'16, Concur'16, QEST'16, LICS'17, FCT'17, MSR'17, FoSSaCS'18, ICALP'18, MFCS'19, RP'19, TIME'19, and more in the previous years. Co-chair of QEST'17 program committee. 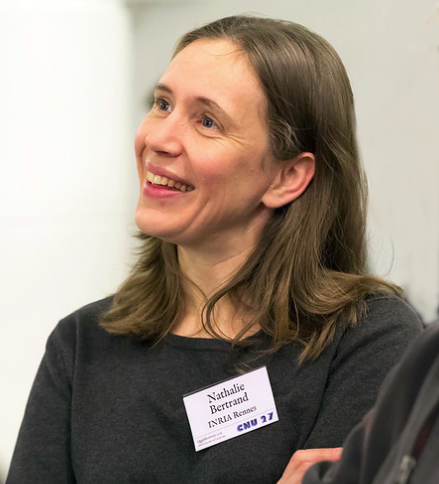 Previously co-chair of QAPL'14 and QAPL'15. Nominated member of the CNU 27: Conseil National des Universités, section 27 (2016-2019). Member (2012-2015) and scientific secretary (2013-2015) of Gilles Kahn PhD award committee. Member of the steering committee of QEST (2012-2015).